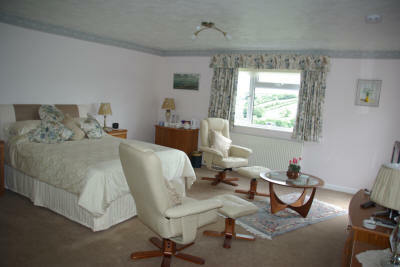 Our three rooms are well decorated and furnished to provide good quality accommodation. We achieved a 4 Star grading from the start and added a Silver award two years later, this has been maintained ever since. Comments in the visitor’s book confirm our ability to please. In June 2012 we achieved a Gold Award and Breakfast Award, and the folllowing year to receive 4 Gold Stars with the AA together with a Breakfast and Dinner Award. From 2017 we have decided to advertise only with Visit Cornwall and Visit Launceston. We are also Quality in Cornwall approved. A selection of good quality soaps, shampoo and shower gel. Our 4th visit! and thanks for making a good holiday GREAT! thanks for the usual superb hospitality. H & H Cambridge. Thank you for a wonderful peaceful holiday. Many thanks for spoiling us. A & P Sydney Australia. Our best thanks once again for making us so very welcome. As always we have been spoilt with wonderful food and friendship. N & J Norfolk. This is a very special place - superb food, wonderful people - must come back P & D Eastbourne E Sussex. This is still the best B & B in the Country. Glad to be back for pampering before Christmas. Kate and Nigel make staying here such a pleasure. J & K. Ness Cheshire. Thank you for such an absolutely fantastic break. We could not have wished for a more hospitable, well equipped home from home. Look forward to spending more time with you in the future. As a disabled person it was lovely to find that Kate seemed to be aware of my needs throughout the time we spent here. J & C South Wales. This room looks over the drive to the front garden. The en suite has a shower cubicle. This room has a 4’ 6” Double bed. The room faces south and has views down the valley. The en suite has a full size bath with a shower unit incorporated. 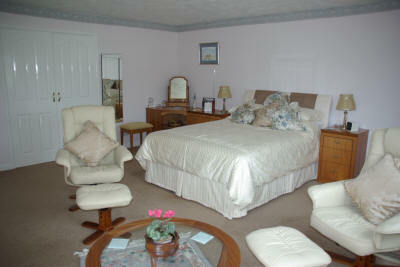 This room has a 5’ King Size bed, two swivel chairs with footstools, coffee table and large screen TV and DVD player. The ensuite has a Tub style bath with shower incorporated. This room is also south facing, there are views of the valley with access to a balcony with seats and the garden via a glazed door. 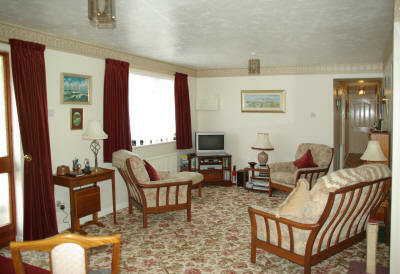 Visitors have the use of a separate sitting room which also has TV and DVD facilities.